One final comment, the hardest hit area was a trailer court along the river that flows through Minot (referred to as either the Souris or the Mouse river). 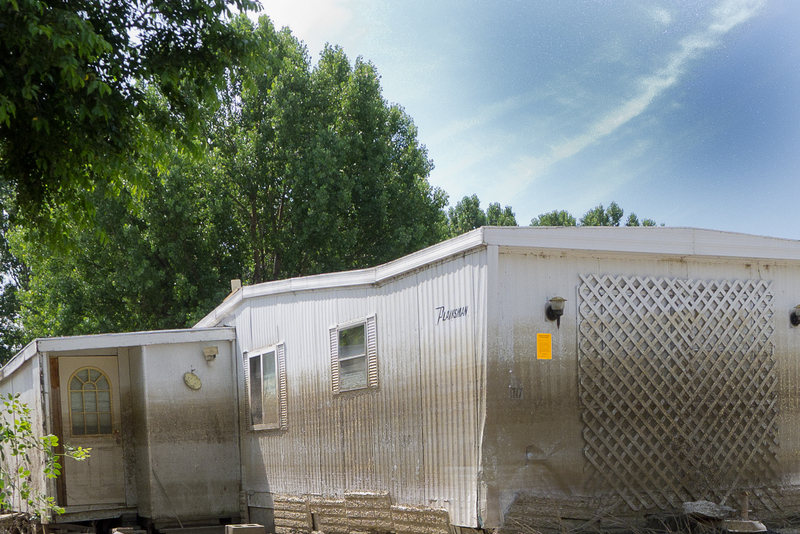 Every trailer in the trailer court looked like this (except for the ones that were toppled over entirely). While this was a trailer court, for the most part it was a nice trailer court. The people who lived here didn’t have much, but they lost everything. The federal government came in to provide significant assistance to many people. I’m not sure that would happen today. I wanted to note that people of modest means were the ones who were the hardest hit by the damage from the Minot flood. While it is hard to take the destruction of a fancy new home with a new mortgage, it is just as hard to take the destruction of a neighbothood you have lived in for your entire life. I mentioned the Minot floods in my previous post. My wife is from Minot and we traveled to the city shortly after the flood had receded. About 4,000 out of 12,000 homes in the city were flooded. Few people had flood insurance. Many of the homes were in areas that had never flooded. This home was less than a year old. You can see the high water mark as well as what the flood did to the contents of the home.